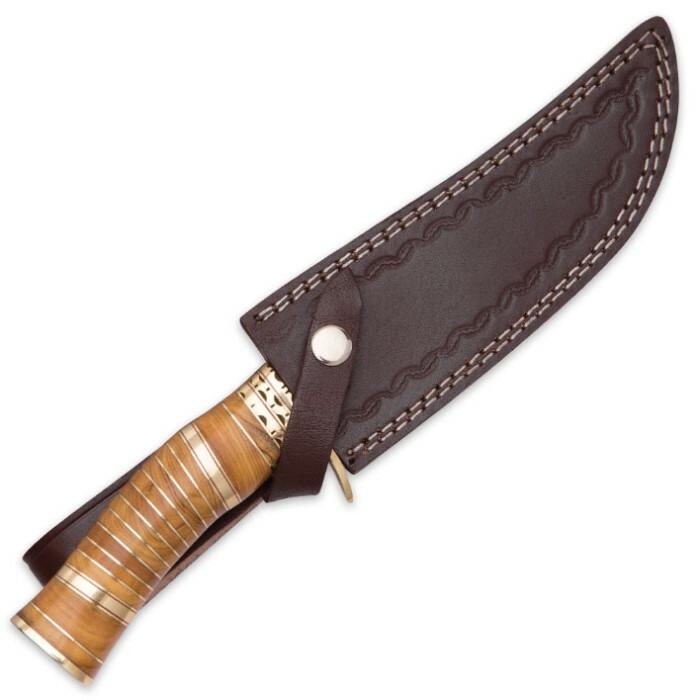 Timber Wolf AncientWood Damascus Steel and Olivewood Bowie Knife w/ Leather Sheath | BUDK.com - Knives & Swords At The Lowest Prices! Timber Wolf’s new AncientWood Damascus Bowie represents the pinnacle of fixed blade design and craftsmanship. No other bowie combines breathtaking beauty, rare wood and steel, meticulous attention to detail, exceptional balance and feel, and raw cutting power quite like the AncientWood. 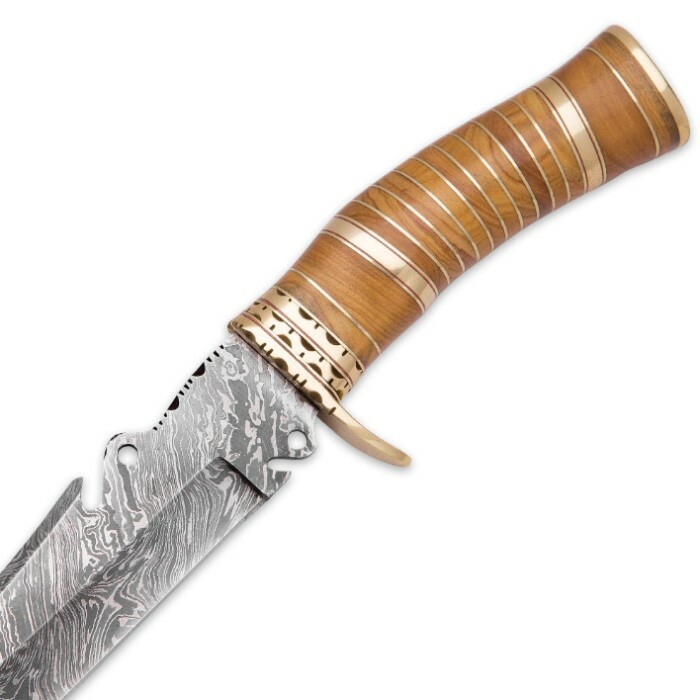 It’s simply unrivaled, especially at this price point, boasting a stunning 7” Damascus steel blade, elegantly scalloped brass guard, shimmering brass pommel and handle accents and a delicately figured olivewood handle. The gracefully contrasting folds in the hand-hammered Damascus steel glint and gleam under light, highlighting the modified trailing point blade’s distinctive spine arc, precise thumb notches and stately through-holes. The legendary steel is paired, fittingly, with olivewood - precious, even sacred, and born of ancient trees that can endure for millennia. With its fine grain, handsome burls and mellow shades of pale cream, burgundy wine and dusky amber, the olivewood gives the AncientWood’s gently curved handle a uniquely refined look befitting the knife’s overall motif. The AncientWood is much more than a pretty face, however. With its razor sharp, hand-honed edge and careful, quality craftsmanship, this full tang beast of a bowie effortlessly slices and cleaves its way through even the toughest cutting jobs - field dressing, skinning, cutting branches and much more. Its impeccable weight distribution and ergonomic handle design gives the AncientWood a balanced, solid feel that makes it a pleasure to wield for even hours at a time. Built to last and protected by the included genuine leather sheath, with proper care the AncientWood can be your go-to fixed-blade for a lifetime and beyond, making it an outstanding family heirloom. Wield the AncientWood once, and you’ll immediately fall in love; you’ve just got to experience it for yourself! Thankfully, bringing home this striking work of bladesmith artistry is easy and painless with our unbeatable prices! Supply is limited, so order today! Recieved this blade yesterday and I must say I was a little taken back when I first opened it up. The knife is very very pretty and it kinda puts you in a trance when looking at it. Timber Wolf did an excellent job on the Damascus and shaping of the olivewood handle. Everything was tight fitting and feels very sturdy, and the sheath is also very well done. It came decently sharp too so overall, I am very pleased with the purchase. I get complimented every time I wear this knife. I have even been asked if it was a collector item. This is an exceptional and beautiful knife. The filework, the olive wood and spacers, are flawless! And mine looks exactly like the photos (different rings of wood, same colors and tone. Never seen a knife as eye catching! 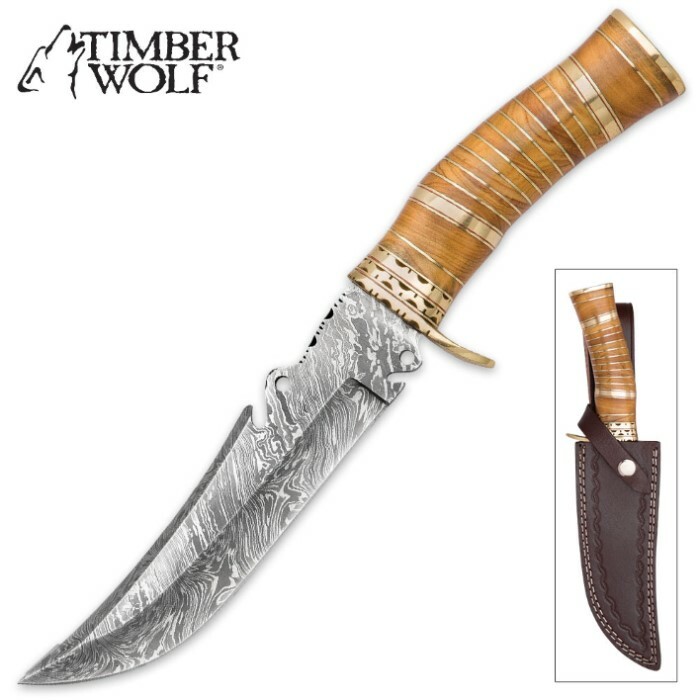 This Timber Wolf knife is one of the most magnificent knifes I have ever seen. The Ancient wood handle is absolutely beautiful I've never seen anything like it, the Damascus blade is also a great design. The Ancient wood knife comes with a very nice leather sheath, and is an eye catcher, I whore the knife one afternoon and was asked about it five times by five different guys. This is one beautiful knife. Thank you Timber Wolf, and Thank you BudK.